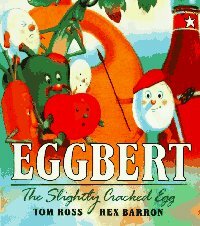 “There once was an egg named Eggbert. He loved to paint beautiful pictures.” Everything seemed to be going well for Eggbert, till one day it is discovered that he is cracked. Poor Eggbert! Shunned by all his refrigerator friends, Eggbert sets out on a journey of discovery. Eggbert's painting skill comes in handy when he tries to disguise himself. He paints himself to look like the background of the places he goes. But each time he is discovered by the residents of that area and is asked to leave. Just when things look there dimmest for Eggbert, he realizes the world is full of beautiful cracks. Cracks in the sky and the land make Eggbert feel better about himself, in fact a little proud of his crack. Your preschoolers will be delighted with this fabulous story. Eggbert has a clear moral that is easy for preschoolers to understand. A wonderful story of discovery and self acceptance, with a bit of humor thrown in. The illustrations are exciting and colorful. Not only will the story hold your preschoolers attention, but the bright illustrations will capture the eye of imagination. I recommend this story for preschool children ages 3 –5.